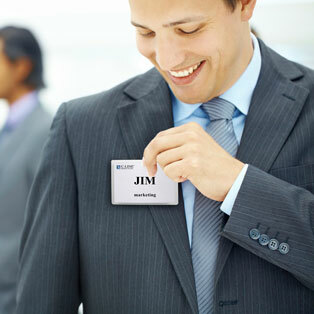 As the creator of the "Hello, My Name is" badge and a market leader in name badge holders, C-Line Products is ready to meet your every need with pin, clip, pin/clip combo, hanging and pressure sensitive name badges and holders. C-Line Time's Up! badges include a variety of expiring badges. And, convenient laser and direct thermal printer compatible inserts make your job easy. Plus, name tent holders make every event more professional and successful! The Self-Laminating Magnetic Style Name Badge Holder provides a permanent seal around the insert to secure the badge in place. Solid hardwood name badge holder lets you get organized for meetings and visitors.